In Houston, old world Tudor-style details and contemporary styling blend for a very comfortable arranged marriage. At a new home in an older neighborhood near downtown Houston, a family with a young daughter who enjoy entertaining built a new home with distinctive, Tudor style details. The couple, especially the husband who works in commercial real estate and loves to cook, wanted it clean and well organized with a minimalist look that related to the Tudor style. 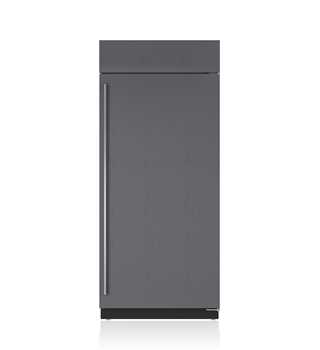 Banishing clutter and keeping cabinetry low kept the feeling open. An eight-foot-long hutch with sliding glass doors tucked into the wall stores dishes and serving ware, its interior finished blue to carry through the home's accent color and better showcase the white dishes. An island gets its old-world Tudor charm with dark walnut panels contrasted with a white marble countertop, metal mesh fronts and turned legs. 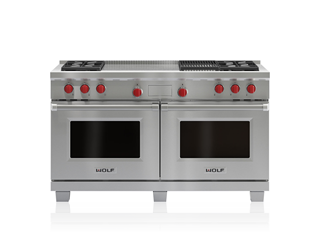 The stainless steel Sub-Zero and 60-inch Wolf range with stainless steel hood contrast add a 'new' element that blends with the old. "That's how we live!" exclaims Lombardi. "We take what we inherit and mix them with modern things. This also shows that modern technology can go very well with traditional settings." At a time in history when many designers are dispensing with grout lines altogether, here the fine white grout lines of the slate floor tiles tie into the room's grays and whites to bring it all together. "The warm whites and uncluttered surfaces are soothing," Lombardi observes. "They let you relax—so you can enjoy your cooking."